Madix understands hardware stores, both big and small. A leading innovator in the store fixture industry, Madix has a history of successfully helping hardware stores solve their merchandising challenges. Making the sales floor efficient is one of the most difficult challenges for hardware and home improvement retailers. At Madix, we offer products that answer the efficiency challenge whether you use standard gondola systems or heavy-duty racking. Our Maxi Line system gives customers more than 48" (1219 mm) of extra facing space by adding 1 3⁄8" (35 mm) to each section. 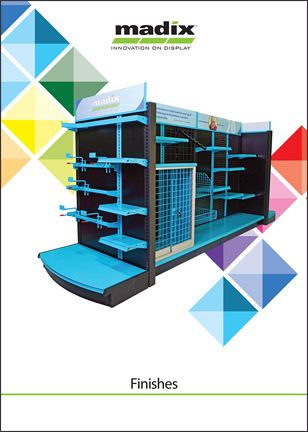 Madix offers medium- and heavy-duty storage and racking lines of varying load capacities that transform your sales floor. This transformation means more products on display, and more selling opportunities per square foot. You do more than any of your competitors, and you miss the opportunity to brag. If you'd tell everybody what you do for us, you'd take over all of the customers. I'm convinced of that. Embed Madix's signage solutions into your fixtures to improve sales. Signage draws attention to specific merchandise and improves sales of your most profitable merchandise. Combine the signage with point-of-sale displays, promotional binning, and accessories that transform your sales floor.